Cosmetic surgery is costly. There are also serious complications and risks associated with cosmetic surgery, from blot clots to infections and in some cases death. Another major risk, of course, is that the outcome is never guaranteed. A doctor can speculate how a patient will look after their procedure, but the result may be different than what the patient expected. Further surgeries may then be required to repair the problem, resulting in additional money spent and more exposure to other risks. Despite these risks, researchers are discovering significant increases in the number of people undergoing cosmetic surgery. Even teenagers, as young as 12, are having cosmetic procedures. According to a new study from the International Society of Aesthetic Plastic Surgeons, approximately 15 million cosmetic procedures were performed worldwide by licensed cosmetic surgeons in 2011, up almost 5 percent since 2010. Where is most cosmetic surgery performed? If you answered the USA, you are correct. When it comes to sheer numbers, more cosmetic surgery procedures are carried out in America than anywhere else, with over 3 million performed in 2011. America is followed by Brazil, China, and Japan. However, according to the new study, when population is accounted for, Korea leads the world, trailed by Greece, Italy, and America. That’s right - Korea has the highest proportion of its population undergoing cosmetic surgery, with one in every 77 Koreans turning to the knife or the needle. Interestingly, some scholars such as Professor Ruth Holliday, of the University of Leeds in England, and Professor Joanne Elfving-Hwang, of the University of Frankfurt, suggest that the number of Koreans who undergo cosmetic surgery is likely considerably higher. The reason being, they say, is that surgical procedures often take place at private clinics and therefore only a fraction of surgeries are recorded, not to mention the industry is said to be globally poorly regulated, Korea being no exception. Indeed, other reports estimate significantly higher rates of Koreans undergoing cosmetic surgery. For instance, NationMaster, a statistical website, puts the percentage of Koreans getting cosmetic surgery in at around 20 percent. Similarly, a 2009 survey by market research firm Trend Monitor, showed that one in five women in Seoul between the ages of 19 and 49 had gone under the knife. Some reports suggest that as much as 50 percent of young adult Korean women under the age of thirty have undergone cosmetic surgery. And, if you think cosmetic surgery is only popular with women in Korea, think again. Korean men are also having cosmetic surgery in significant numbers. For instance, the Korean Association for Plastic Surgeons estimated that the number of Korean men who had cosmetic surgery in 2010 stood at around 15 percent. To accommodate the increased demand for cosmetic surgery, the number of Korean doctors trained as plastic surgeons continues to increase. Non-specialists are also trying to capitalize on the popularity of cosmetic surgery. For instance, some oriental medicine clinics are now promoting breast enlargement via acupuncture. Not only is cosmetic surgery growing in popularity in Korea, but attitudes have become more open about the practice. Nowadays, many people post before-and-after photos on the internet and in advertisements. Money is certainly one motivation for doing so. Some clinics offer free surgery or a substantial discount if patients allow the entire process to be photographed and published. However, some people document their transformations simply so that those contemplating surgery can learn from their journeys. This, of course, still begs the question, what has led to a thriving cosmetic surgery industry in Korea? Stated differently, why are Koreans having cosmetic surgery in increasing numbers? One explanation is that an attractive appearance is associated with positive social benefits. And therefore, undergoing surgery is regarded as a worthwhile investment. Research certainly reveals cultural prejudices toward attractive faces and physiques. For instance, matchmaking agencies in Korea often rate facial attractiveness as the most important factor ahead of other qualities such as educational or family background for those who are seeking a favorable marriage match. Moreover, numerous studies have found that at the workplace and in their careers, overweight and unattractive people frequently meet prejudices in hiring, in advancement, and in salary. For instance, in a recent survey of over 200 job recruiters in Korea, almost 70 percent admitted that the appearance of applicants affects their decision. Similarly, in his book Looks: Why They Matter More Than You Ever Imagined, Professor Gordon Patzer, of Roosevelt University in Chicago, documented research which found that better-looking business executives tended to earn more. Appearance even influences court decisions, at least according to a British study which found that judges often assign lower bail for defendants who are physically attractive. Given these cultural preferences, it is arguably not surprising that many people are having cosmetic surgery. Celebrity influence is believed to be another factor behind the cosmetic surgery boom in Korea. Many well-known Korean male and female celebrities have drastically altered their appearance by having surgery, including Miss Korea 2012 Kim Yu-Mi and Kim Hyun-joong, formerly a member of the boy band SS501. Their successful transformations provide motivation to those contemplating surgery. This is reflected in reports that many patients visit clinics with photos of celebrities, asking surgeons to duplicate their appearance. In addition to this, some TV dramas and films glorify cosmetic surgery. The hugely successful 2006 Korean film 200 Pound Beauty is one example. The film is about an overweight girl who undergoes extreme plastic surgeries to become a pop sensation. Another explanation behind the cosmetic surgery boom in Korea is the desire to achieve a more ‘Westernized’ look. This is reflected in the popularity of certain procedures. One of the most popular in Korea being ssankapul surgery, commonly known as double eyelid surgery, which reduces excess skin in the upper eyelid to make the eyes look bigger. "It is not uncommon for females aged 15-16 to seek this procedure," says Ms. Sohn Ji-Won of the Grand Plastic Surgery Clinic. 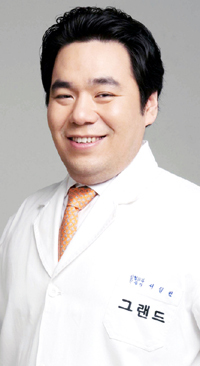 "Koreans put lots of importance on thier appearance," Dr. Seo Il-Beom of the Grand Plastic Surgery Clinic agrees. "That's is the basic reason for the increasing number of cosmetic surgeries taking place in our society"
With over 30 highly professional surgeans specializing in each of their expertises the Grand Plastic is gaining popularity amongst locals and internationals. It is one of the largest plastic surgery centers in South Korea. In parcular, Grand's multilingual coordinators are able to offer excellent translation and interpretation services in languages including English, Chinese, Japanese, Russian, Mongolian, Vietnamese, and Indonesian. Another popular procedure is jaw reconfiguration, which was originally developed to correct orthodontic problems like underbite and crossbite but has now become an increasingly popular means to achieve both a smaller and more sharply-defined face. Of course, altering one’s appearance to achieve a particular look is not a new phenomenon. People have been engaging in appearance modification practices for centuries and across cultures. For instance, in pre-industrial China, where tiny feet were seen to be a sign of beauty, women bound their feet. The Mayans practiced body piercing. In Egypt, tattooing was prevalent. However, whilst humans have engaged in body-altering practices for centuries and across certain cultures, Korea is not one of them. This does not mean that appearance has not long been valued in Korea. Historically, a neat and well-kept appearance was a marker of social class and a sign of an orderly life. Until recently, though, deliberately altering the body’s appearance was not a common practice in Korea. This owes much to Confucianism, which formerly played a major role in the life of Korean society. Confucianism strongly urges against altering the body as it is considered a gift from one’s mother and father. Is Confucianism still valued in Korea? Yes. This is evidenced by, among other things, a deference for the elderly. But, attitudes to Confucianism, at least in terms of the body, are certainly “undergoing surgery,” pun intended.